Happy to be here: Jones was determined to enjoy himself. Funny thing about pressure: It's usually self-inflicted. Shortly before the men's final of the GenerationPool.com 9-Ball Championships, Jeremy Jones allowed the significance of the looming title to sink in. His inner monologue went something like, "It's been a while." 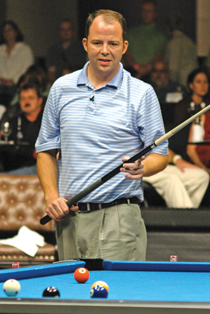 Since winning the U.S. Open 9-Ball Championship in 2003, Jones had been scarce on the last day of most pro events - those he decided to enter. The rangy Texan typically stuck close to home in the Houston area - spending time with family, helping look after his father as he battled brain cancer, and enjoying life with his longtime girlfriend, Alicia. Jones remained in the top tier of U.S. pros: He sank the winning 9 ball for Team USA at the 2005 Mosconi Cup, and hit most major events. But the individual titles were sparse. "I've won some tournaments lately, but in the last few years nothing of any consequence," Jones said. "So, being in the position to win that [GenerationPool] event, I kind of put a little too much extra pressure on myself." Jones felt himself rushing in the beginning of the race-to-7 final against Ronnie Wiseman. But when the match began to devolve into a sloppy, rollicking comedy of errors, Jones eased up. "I've never had so much fun dogging it," he said. "I was dogging it, and I knew I was dogging it a little bit. I was trying to work my way out of it. Overall, I was just going to make sure I enjoyed what was happening. "To get in that situation - win or lose - not to enjoy it would be the worse thing." Jones finally outpaced Wiseman, 7-4, at the Championships - held June 9-12 at the Charlotte (N.C.) Convention Center - to win his first major title in five years. In the women's final, China's fearsome Xiaoting Pan conquered her own self-inflicted pressure against frequent foe Ga Young Kim to win her first title of the season, 7-4.